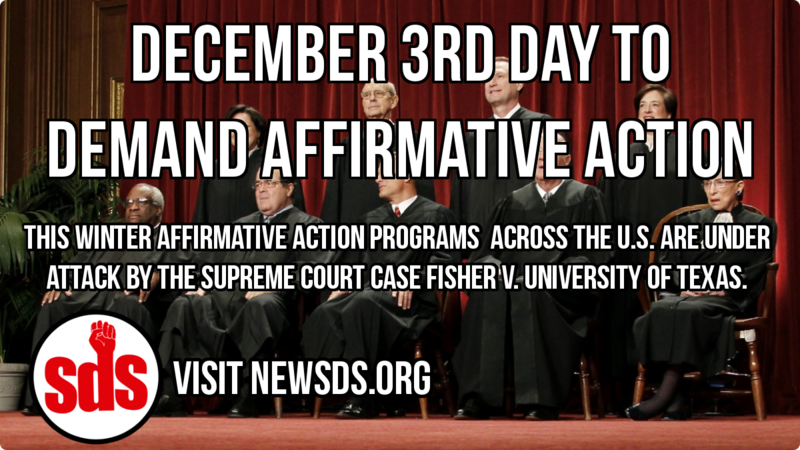 On Thursday December 3rd, Students for a Democratic Society (SDS) chapters and affiliates are holding a Day to Defend Affirmative Action in response to the Supreme Court case starting December 9th. The Supreme Court of the United States has decided to take a second look at the Fisher v. University of Texas case, which deals with the legality of the affirmative action program used in the University of Texas system. However, the decision made in this case will decide the fate of affirmative action programs in colleges and universities across the United States. Affirmative action programs were valuable gains won through the struggles of African American and other oppressed nationality students in the 1960s and 70s against segregation and racist discrimination in education. Affirmative action programs were also key in benefiting women's admissions to universities. Today students still face racist admissions practices used by U.S. colleges and universities. Exclusionary entrance testing requirements as well as legacy preferences are just two common policies that continue to discriminate against oppressed nationalities. At the same time affirmative action programs have been under attack since they were first established. Supreme Court decisions in 1978, as well in 2003 were significant in weakening affirmative action programs. 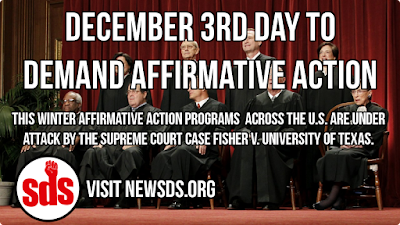 In 2014 the Court ruled to uphold state bans on affirmative action, which have already been established in eight states: California, Washington, Michigan, Nebraska, Florida, Arizona, and Oklahoma. The SDS chapter in Tallahassee has already begun the fight to overturn the ban in Florida. Students need to fight to overturn these bans where they exist, as well as fight the current threat to affirmative action policies across the country. SDS chapters and affiliates will be holding rallies, sign-holdings, teach-ins, and other campus actions on December 3rd. SDS supports any groups involved in actions to defend affirmative action and end racist admissions policies including protests, postering events, banner drops, cultural events, and more. End Racist Testing and Entrance Policies!